Spin Group recently launched a new website for SecureParkingUSA.com. The main goal for the website is to connect drivers to one of the many SecureParkingUSA parking facilities. Having already invested in a solid user interface experience, SecureParkingUSA tasked us with building the site based on their design while adding map search and blogging functionality. Their old website did not have a location search and was difficult to maintain. Since mobile devices are primarily used for finding parking spots, building the location search and keeping it updated with new locations was very important. Both the client and our developers agreed that WordPress was the platform to build on. One of the main design challenges was to incorporate a search feature that would find nearby parking areas and display them on a map. To minimize custom development costs, we searched for existing but solid plugins that can save time and money to build the location search feature. We ended up leveraging a WordPress plugin called LocateWP. It provided a good location search platform with features we needed already in place. 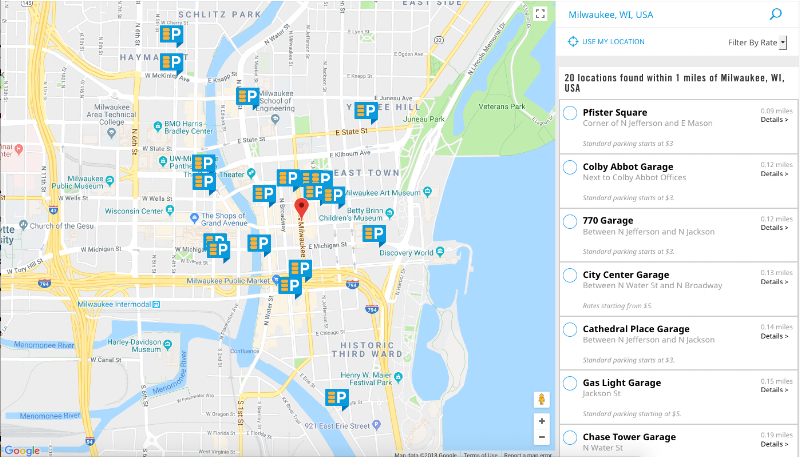 With a bit of customization, this plugin gave the website the capability to search local parking garages without the cost of starting from scratch. LocateWP uses the Google Maps API. The beauty of using the Google Maps API is that it provides large-scale geographic integration at a low-cost. It is also very reliable. Google also provides a lot of the documentation necessary to embed their map services. Another feature we added include a way to easily relate promotions and news to parking locations and regions, so that visitors will only get promos and news that are relevant to them. The Secure Parking Map displays parking locations as well as displays a side panel of results. Overall, the customer was very happy with the result. If your site requires location search or some other custom functionality, call us to discuss! By leveraging existing WordPress tools to your advantage, we can add significant value to your project.